Benjamin Watson, tight end with the New Orleans Saints, and his wife Kirsten funded an ultrasound machine through the ERLC’s Psalm 139 Project for a Baptist Community Health Services center in New Orleans. They are joined by former SBC President Fred Luter, a BCHS board member, as well as Hannah Pounds, far left, chief medical officer, and Robert Jemison, far right, family nurse practitioner. 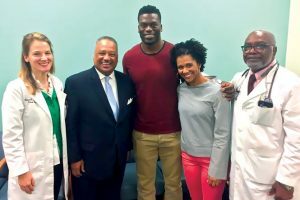 NEW ORLEANS (BP)—National Football League player Benjamin Watson has again joined with the Southern Baptist Convention’s ethics entity to provide an ultrasound machine for the benefit of women in crisis pregnancies. Earlier this year, the Watsons largely funded an ultrasound machine for the Severna Park (Md.) Pregnancy Clinic outside Baltimore, where he played for the NFL’s Ravens the previous season. They made the donation—which resulted in the machine being installed in June—through the Evangelicals for Life (EFL) partnership of the ERLC and Focus on the Family.